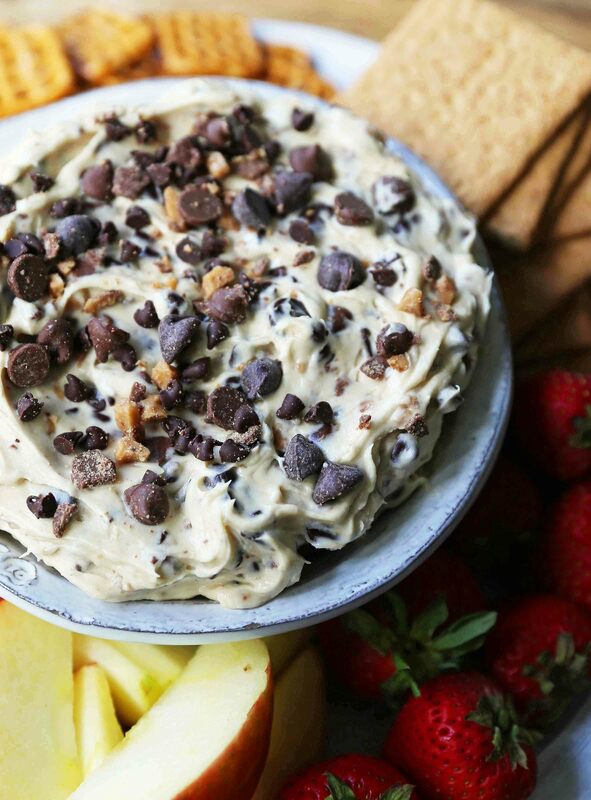 A sweet cream cheese dip with chocolate chips and chocolate covered toffee bits. Perfect for parties and potlucks and always a crowd favorite! 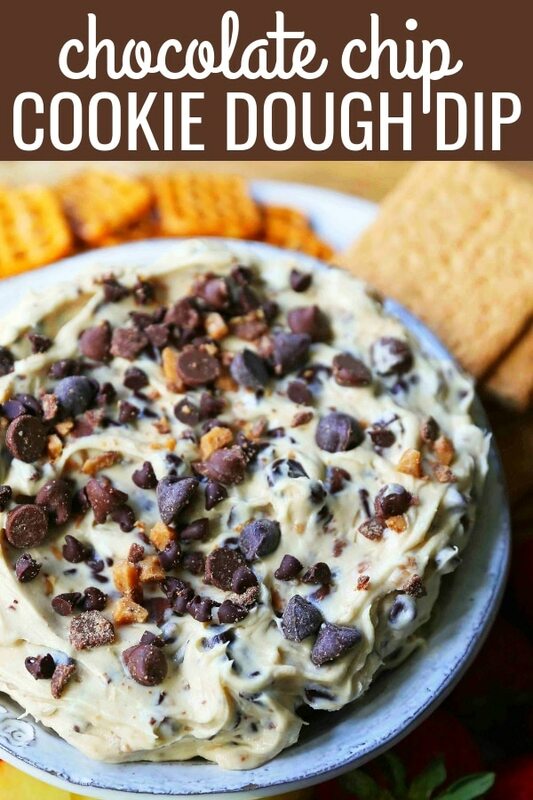 Don’t leave me alone with this chocolate chip cookie dough dip. I could literally eat the entire bowl! It is one of my favorite things to bring to parties because it can be whipped up in less than 5 minutes and everyone loves it. People will beg you for the recipe! One of my favorite oldie recipes on Modern Honey is a Monster Candy Bar Dip using all of that leftover Halloween candy. This is another super popular recipe for parties. 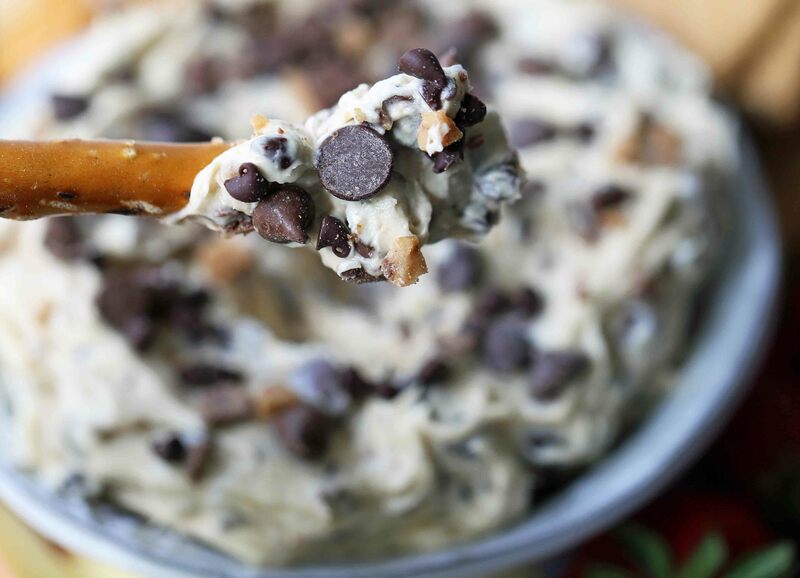 This Chocolate Chip Cookie Dough Dip is made with only 7 ingredients — cream cheese, sweet cream butter, brown sugar, powdered sugar, vanilla, chocolate chips, and chocolate toffee bits. 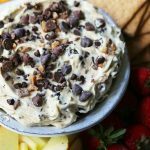 It is a no-bake chocolate chip cream cheese dip so it has the same creamy flavors without all of the work. Start with softened cream cheese. Whip up the cream cheese and softened butter for 2 minutes. Add brown sugar, powdered sugar, and vanilla and beat for 2 minutes longer. Fold in chocolate chips and toffee bits. I use a mix of semi-sweet and milk chocolate chips. My go-to favorite brands are Ghirardelli, Guittard, and Trader Joe’s (the chips not the chunks). I do throw in 1/2 cup of Nestle mini chocolate chips too to change up the texture. I love to use the Milk Chocolate Heath Toffee Bits. Cover and chill in the refrigerator before serving. Serve with pretzels, pretzel rods, fresh apples, strawberries, graham crackers, or anything else you can dream up! Chocolate Chip Cookie Dough Dip. 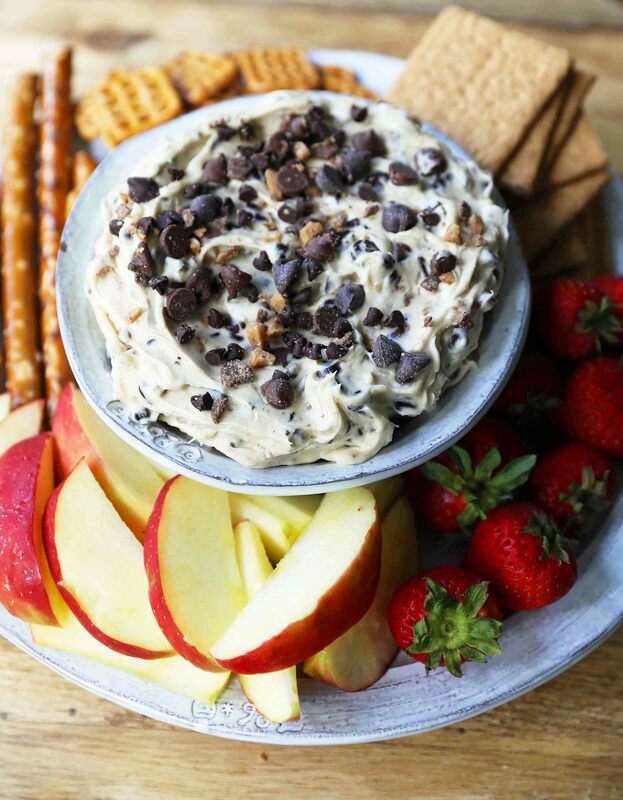 A sweet cream cheese dip with chocolate chips and chocolate covered toffee bits. Perfect for parties and potlucks and always a crowd favorite! In a large mixing bowl, whip together cream cheese and butter for two minutes until light and fluffy. Add brown sugar, powdered sugar, and vanilla and whip for two minutes longer until creamy. Fold in chocolate chips and milk chocolate toffee bits. Reserve 1/4 cup of chocolate chips to sprinkle on the top of the dip when ready to serve. Cover and place in refrigerator to chill until serving. Serve with pretzels, apples, strawberries, pretzel rods, and graham crackers.